The forces of natural selection have been a primary driver in the evolution of adaptive animal behaviours. On the one hand animals must evade predation in order to survive and pass on their genes; on other hand, and for the same underlying reasons, animals must also be capable of successfully capturing prey. This situation has led to an evolutionary arms race in which predator and prey are locked in the battle to survive. A common strategy in each situation is to enhance the speed of response, resulting in the evolution of neural, muscular and biomechanical designs that produce supremely fast and eye-catching behavioral responses. 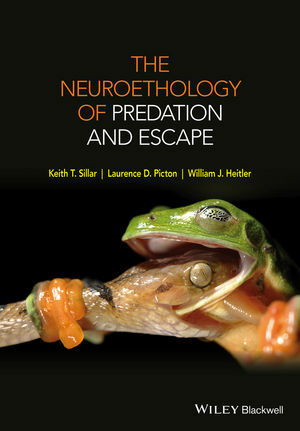 The aim of this book is to illuminate the design principles of escape and predatory behaviours using a series of case histories from different animal groups and to emphasize the convergent evolution of neural circuitry that optimizes the chances of survival. Using these case histories the authors describe sensory mechanisms that aid prey and predator detection, central neural circuit designs that increase speed of response and neuromuscular and biomechanical properties that aid the performance of escape and predatory movements. Keith T. Sillar is Professor and Head of theSchool of Psychology & Neuroscience at the University of St Andrews, in Scotland. His research interests include neurology, neuroscience and amphibian neurology. Along with Dr Heitler, he teaches an exchange course on neuroethology in the US. Dr William J Heitler is a reader at the School of Biology, University of St Andrews in Scotland, where his research interests include the neurology of crayfish and other crustacea, and escape behavior as well as more general neurology and neuroscience. He teaches an exchange course on neuroethology in the US in conjunction with Professor Sillar. Laurence Picton is at the School of Psychology and Neuroscience at University of St Andrews, Scotland.